Finding the perfect gift for someone is not only tough but a pain. I’ve even gone so far as not attended an event just because I couldn’t figure out the gift in time. Not because I am cheap, I would happily hand them an envelope with a $20 or $50 in it mafioso style, but that is kind of tasteless at my age. Moreover, I think it subconsciously says that they are not worth the time and effort to do something for. However, finding the right gifts for coffee lovers is a breeze. Plus, most everyone drinks coffee, if not love it. Not only can you find many gifts for coffee lovers around $20, (95% of items listed are under $20) but you won’t seem cheap. More importantly, they’ll use it and you’ll come off as the thoughtful person you are. I always try to think of a useful gift they would actually use, but then the gift becomes too expensive. Perhaps they’re just casual friends and it’s not necessary to give them an expensive gift. This post idea came up when I had to get a gift for my friend’s girlfriend. I figured she liked coffee. I decided to get her a coffee subscription service from Peet’s Coffee. The month coffee subscription cost me around $20 for a pound. She can’t stop raving about Peet’s coffee subscription because a new bag of coffee comes in every month. Every time I see her she tells me about a newest one. Which is great because honestly, we don’t have much else to talk about. 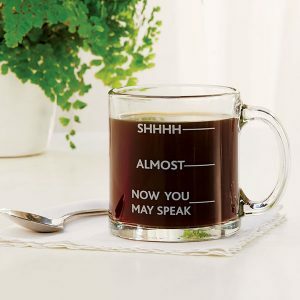 Below I’ve compiled a comprehensive list of gifts for coffee lovers. It really doesn’t matter if they’re obsessed with coffee like me, or if coffee is simply a part of their morning routine. Really, it’s the thought that counts. I’ve organized this post into coffee gift item sections of coffee itself, coffee mugs/tumblers/cups, and coffee accessories. You can skim through the table of contents to find the specific product. Down at the bottom you can find an empty gift basket, clear cellophane gift wrap, the straw colored shredding, and bows to make your own custom coffee gift basket. That way, depending on the person, you can get the coffee lover several items and make a great gift basket yourself. Regular coffee not giving you that kick that it used to? 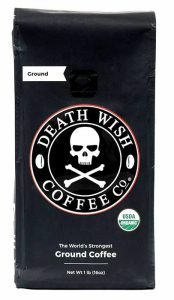 Try giving Death Wish Coffee, the worlds strongest coffee as a gift for coffee lovers, especially if that person is a little sluggish. Not only is the coffee packaged uniquely, but it will help the drinker overcome any obstacle that day — even if that obstacle is a brick wall. I tried this coffee and it is really smooth. It’s not rough or overly acidic as I assumed it would just to get those extra mg of caffeine in it. You don’t really notice it’s a strong coffee until about 15-25 minutes later and you feel your heart pumping. Death Wish also have various flavors too, so if you want to give the best gift to your coffee loving friend try to get a flavor you know they will like. While living in the States, I always drank commercial coffee. When I traveled a bit, I began discovering many great varieties from brands I’d never seen before. What better way to find a good coffee than to sample different kinds picked out by true coffee aficionados? 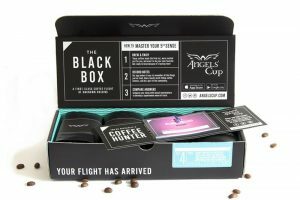 Coffee subscription services make a great coffee gift, and many are under $20. It’s literally the coffee gift that keeps on giving! 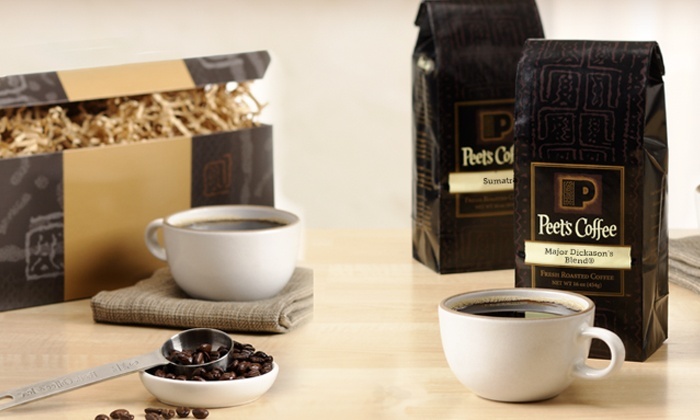 Check out the subscription from Peet’s Coffee, where coffee connoisseurs select the best tasting coffee from around the world and send them to your friend’s door. Another great option is Stumptown Coffee Roasters. They offer sample packs for those of us who can’t decide on just one roast. Start your friend (or yourself) off with a month, and you’ll immediately wonder why you didn’t subscribe sooner. Of course we all know coffee is delicious. That being said, maybe a great gift for coffee lovers would be coffee flavor syrup from Torini. With so many flavors available make sure you get a good quality one that isn’t just full of sugar. 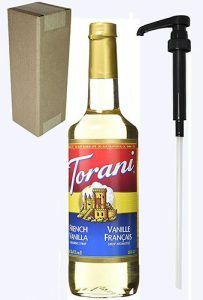 I see this Torini French Vanilla syrup at some coffee shops. It’s made with pure cane sugar and is naturally flavored. This particular one comes with a pump too. Sugar free with the pump is available as well. A vacuum insulated tumbler is the perfect leak-proof gift for any coffee lover. This classic tumbler is made of stainless steel and comes with a plastic straw. It also fits most cup holders and comes in a bunch of colors. Of course, you can use for coffee in the morning and switch to beer when it’s 5pm somewhere. Your coffee friend probably has a ton of mugs. Maybe their cabinet is bursting at the seams like mine with coffee mugs. However, if someone gifted me a coffee mug with a pun on it or a joke, it would immediately become my new favorite. I personally like this one since it suits my sense of humor. Depending on your friend’s taste, you can find mugs that are sweet, humorous, or NSFW. Whichever route you take, your friend is sure to appreciate the thought that went in to finding the perfect coffee accessory for them. The goal of this site is to help you brew better coffee at home. As we all know, even the most perfect cup of coffee can spill, get cold, or worst of all, burn your hands. But fear not, my java-loving friends! You can save your coffee loving friends from experiencing such travesties with a travel coffee mug. I mean, I get it, it’s just a travel mug, but there are things to consider. 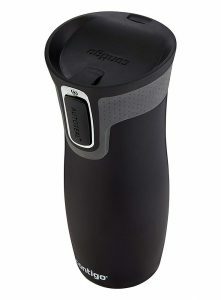 That’s why I like the one made by Contigo. We all have had the unpleasant experience of coffee spilling on us because of a loose lid. Well, these lids are sealed! Law enforcement officers rejoice! This is one of the better gifts for coffee lovers because it warms your donut AND has a mustache guard. 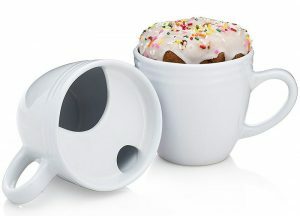 The donut warming mug features a flat, recessed lid where you can set your donut. There are two small holes in the cover that release the perfect amount of steam to warm your treat, while also holding in the heat to keep your coffee hot. For someone who loves iced coffee, you can’t go wrong with an iced coffee sleeve from JavaSok. 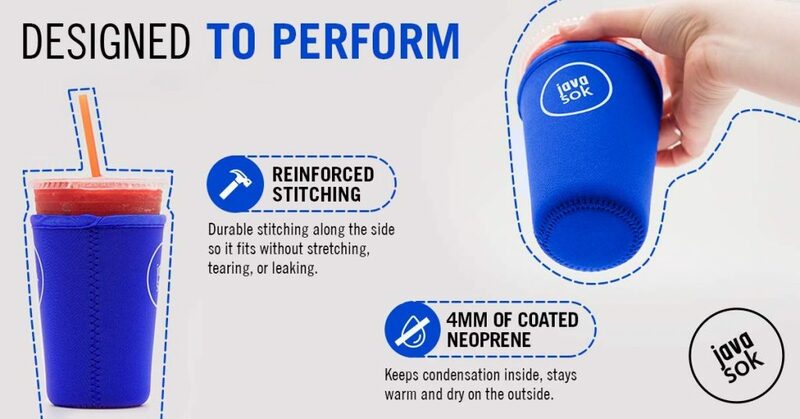 This handy coffee accessory will absorb condensation from an iced drink so it doesn’t end up on your hands, clothes, or surfaces while you’re on the go. Do the environment a favor and get one of these coffee accessories as a gift for coffee lovers instead of letting them continuous use the paper sleeve the coffee shop gives you. Pro Tip: Find out the coffee lover’s favorite color and get that one. Whichever coffee accessories your friend uses, a Nespresso or a Keurig coffee machine capsule carousel is an essential coffee accessory for them. Starting around $12.99, it’s also a gift for your wallet. 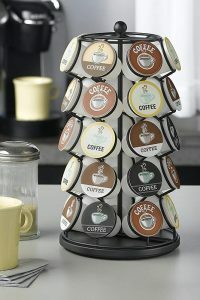 Coffee carousels are especially useful coffee accessory because you can see the lid of each pod, which makes it easy to select the drink flavor you want. If your budget allows for it, the pod carousels can be very stylish gifts for coffee lovers in addition to being space-saving. Another thing is if your friend doesn’t have a lot of space on their counter you can always get them the drawer version. Cold brew addiction is quickly taking over the world, so be a good enabler and get your coffee loving friend this great coffee accessory. I remember when I first heard about this cold brew concentrates. You brew your coffee super strong, leave in the fridge overnight to percolate for at least 12 hours and the coffee concentrate lasts up to 2 weeks. Personally, I wouldn’t keep coffee around for that long no matter how air tight they claim their device to be. 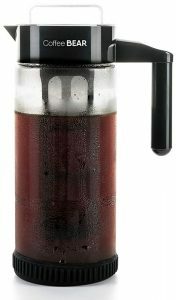 However, this Cold Brew Coffee Maker by Coffee Bear makes it possible. It also comes with a recipe book. It’s made of sturdy materials that are easy to clean. Espresso machines are usually fairly expensive and take up a bit of real estate on the kitchen counter. If you have a friend who loves espresso, but doesn’t have room for a large machine, then I recommend this stovetop espresso maker is a great gift for coffee lovers. This espresso maker from Bellemain is super easy to use coffee accessory. Just add ground coffee and water, then turn on the stove. The pot is made of aluminum, so it heats quickly. The Italian coffee maker considered safety too. The knobs and handle stay cool to the touch while it’s brewing up a piping hot espresso. 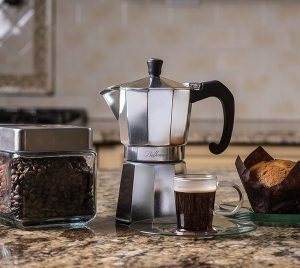 In no time, this stylish Italian espresso maker will fill your home with the sweet aroma of coffee. Getting a good foam can be difficult, especially at home. 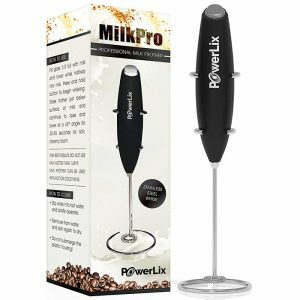 If your coffee-obsessed loved one craves a good latte, but you doesn’t want to spend a fortune on a frothing machine, consider getting them this battery operated handheld frother from PowerLix Milk is one of the better coffee accessories. If your friend is really a coffee connoisseur, (my friends use the endearing term of snob with me) then they probably know how much of a difference pour over coffee makes than a traditional drip coffee maker. So another perfect gift for a coffee lover is a pour over coffee kit. 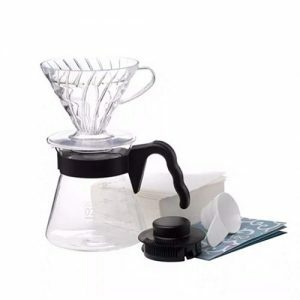 The Hairio V60 Pour Over Starter Set might be a good gift if your coffee loving friend doesn’t have access to coffee at work. It’s on of those small enough coffee accessories to leave at the office and easy to clean too. Since it’s a complete set it’s one of the better gifts for coffee lovers. I love iced coffee, but I hate it when the smooth, flavorful drink I’ve been craving gets watered down by ice cubes. 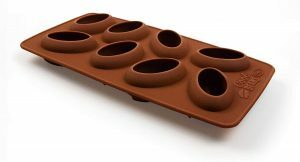 Do your friend a favor and get one of these cute coffee bean shaped ice cube trays and don’t let your friend suffer from watered down coffee again. To use, just brew a regular pot of coffee, pour it into the coffee ice cube trays, and pop them in the freezer. When you want an iced coffee, fill your glass with these coffee cubes instead of ice cubes made with water. The trays are made of silicone, so the ice cubes will easily pop out. Some days we just don’t have time to make coffee at home. Other times, you might feel like treating yourself to a professionally made cup of joe. A gift card to your friend’s favorite coffee spot make wonderful gifts for your coffee loving friend in these instances. Many stores like Starbucks, Peet’s Coffee, and Dunkin’ Donuts let you order gift cards online. I really like this coffee art. In my opinion, it’s a great gift for coffee enthusiasts. 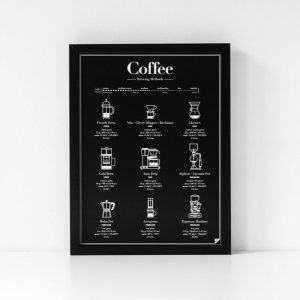 This poster describes multiple coffee brewing methods. I feel this is a good gift for coffee lovers if they are a minimalist, or perhaps they just moved in a need to spruce up the place a bit. Either way, you can’t go wrong with this coffee art. One of the best gifts for coffee lovers is a basket filled with coffee accessories. You can find great deals on seasonal baskets, or you can DIY on your own. Start by filling a basket with some of your friend’s favorite coffees. You could even do an assortment of different K-cups. Add a personalized mug and some delicious chocolates or cookies and voilà, you have the perfect, thoughtful gift. Check the bottom of the post for links to all the supplies to make a really great coffee gift basket. If you are like me and want everything pre made, then check out this Gourmet Coffee Gift. This one is $24 (sorry it’s over $20), but it’s the best bang for your buck because it offers the most and looks cool. 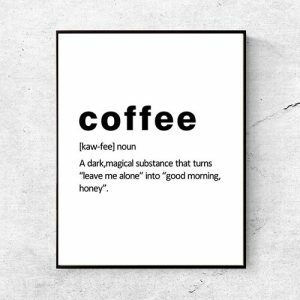 The thing with this one is it doesn’t label the coffee. You have to taste it blindly, and you can write the notes in the downloadable free app. If they like it they can order more. Looking for great gifts for your coffee loving entrepreneur friend? 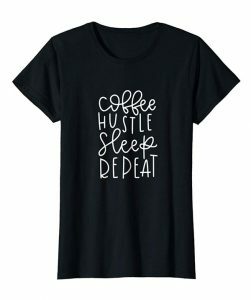 These shirts are for those that needs to profess their love of coffee to the world, this adorable coffee, hustle, sleep, repeat shirt is a must. Comes in his and hers. It even comes in multiple colors so you can select the one that best suits your friend. If your friend is like me, they simply can’t function without their daily caffeine fix. However, some days we get too busy even to make a cup of coffee, let alone sit down to enjoy it. Great gifts for coffee lovers are ones that are useful. If your friend is busy then chewable coffee cubes are a great gift. Whether they’re on the go or just need a quick afternoon pick me up, these cubes will put the pep back in their step. This minimalistic home décor piece is both stylish and witty. I bet you already have a friend in mind who would love this eye-catching print. These type of artsy gifts for coffee lovers will show off your friend’s excellent eye for style, as well as their humor and love of coffee. Only the truly coffee obsessed love the smell well enough to slather it all over their bodies. 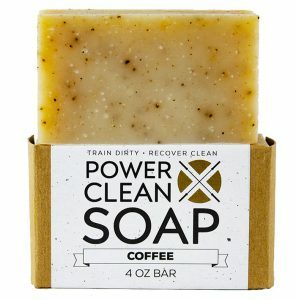 If you know someone who is genuinely in love with the aroma of coffee, this exfoliating soap coffee gift is one of the the greater gifts for coffee lovers. Uniquely Invigorating: Organic Coffee will naturally remove dead skin cells which leaves skin feeling smoother and also reduces the redness and inflammation which will make your skin brighter and healthier. Aromatic lemon essential oil will reduce oiliness of your skin while patchouli delivers a pleasant tingling sensation to stimulate blood flow and aid with muscle repair while opening your airways. This soap is loaded with skin loving therapeutic grade essential oil. Long-Lasting Moisture: Unlike ordinary sports soap, our bar lasts 3x longer + contains 10% glycerin (a superior humectant and moisturizer) to protect your skin instead of stripping its natural oils. Made with organic ingredients, all-natural essential oils. You may have thought you’d already found perfect gifts for coffee lovers on our list, but hang on just a second. Let me show you this coffee lip balm from Lip Smacker. Great for that personalized basket full of coffee accessories. When you’re craving the taste of coffee, consider reaching for this yummy coffee chapstick. The affordable balm will satisfy your coffee cravings even if you can’t get your hands on a steaming mug of java. 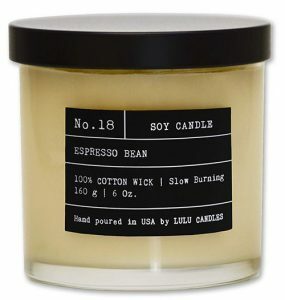 This espresso scented candle has got to be one of the greatest blessings of the coffee gods. One of the few coffee accessories that is a great gift for coffee lovers because it will fill your space with the delicious aroma of fresh coffee. I don’t think I know any girl that wouldn’t love this. 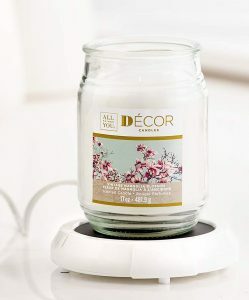 Made with Soy Wax – Eco-friendly soy wax. It is vegan, paraben free & cruelty free! Pamper your better half by lighting this candle and running them a bath. Can you even imagine a better way to relax? Okay, this is one cool coffee accessory. 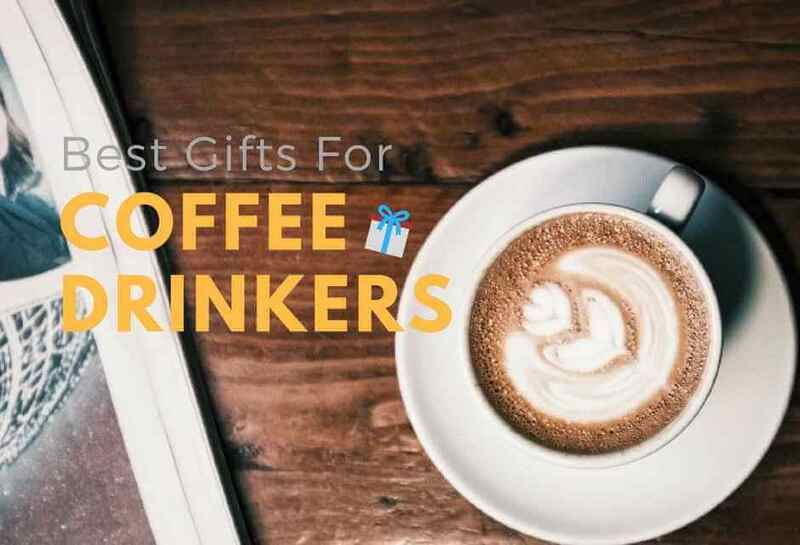 And it’s the lowest priced item on this list of gifts for coffee lovers. I think that this is one of those gifts for coffee lovers that they won’t know they need, until they try it. The main purpose of this coffee accessory is to warm up a candle from under to release the scent without lighting the wick. I haven’t tried it myself because I am not much of a candle person. However, I did get this coffee cup warmer and I think it would also be one of the better gifts for coffee lovers. Cats and caffeine might be the best combination ever. If you have a feline-loving friend who is also addicted to coffee, make their day and give them this great gift for coffee lovers with one of these adorable shirts. Your friend will look and feel great walking down the street decked in either of these T’s. Bonus: She’ll spread good cheer to everyone else who sees her quirky shirt. It’s hard to imagine someone opening a bag of coffee and not finishing it before it goes bad, but I’m sure it happens from time to time. 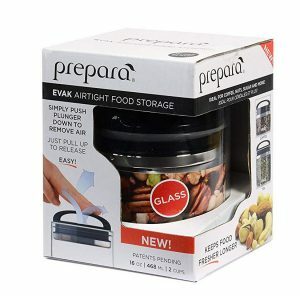 This Evak canister is $22 but one of the better gifts for coffee lovers, so they can keep their coffee beans fresh. Plus, it’s BPA free and dishwasher safe. You can use these stackable canisters for herbs and other pantry items, so these would make an excellent gift for a friend who loves to cook as well! The more affordable and smaller coffee canister from Evak can be found here. We all need something on the coffee table for our guests to skim through. 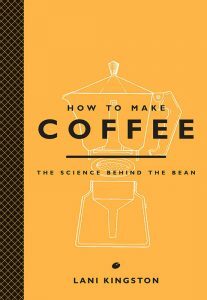 This book, “How to Make Coffee: The Science Behind the Bean” is a great gift for coffee lovers because it explains to readers how to make an exceptional cup of coffee. No matter how good their barista skills are they can always learn a quick tip or 2. It’s ideal for the budding coffee aficionado or really anyone. We could all use a few pointers on our morning cuppa, don’t you think? I’ve found that coffee has the magical ability to bring out the best in people and bring us together. If your world is full of coffee lovers, you have quite a blessing on your hands. Show these special people how much they mean to you with unique, personal gifts for coffee lovers from our list.